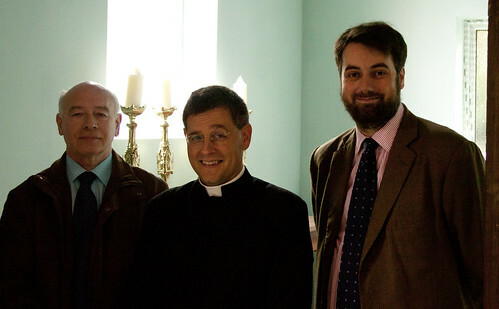 It was a great privilege to have Fr John Hunwicke of the Ordinariate directing our Latin Course. He is a deeply experienced Latin teacher, having done three decades teaching Latin in Lancing College, and his wit and erudition was greatly appreciated by the students. It is part of the point of having the Latin Course running alongside the Summer School for children that we can combine our resources in various ways, including liturgically. 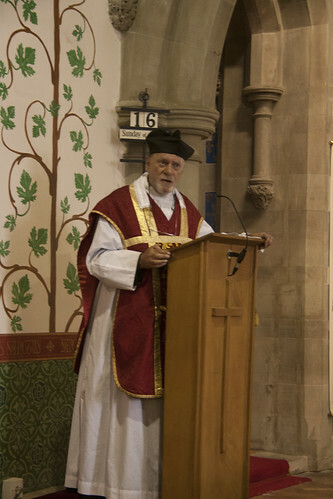 So the second Latin tutor, Br Richard Bailey of the Holy Name, Manchester, who is an extremely talented singer, joined our schola, and Fr Hunwicke celebrated Mass some days, and for most of the week made it possible for us to have Solemn Mass. 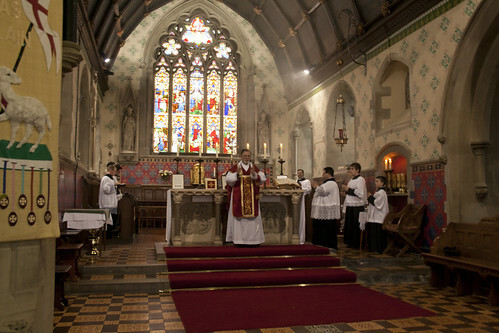 So it was in the Pugin chapel at the Franciscan Retreat Centre at Pantasaph, where the courses took place, that Fr Hunwicke said his first Missa Cantata following his recent ordination, and his first Solemn mass, on the feast of St Anne. In fact, he told us that he'd never done Missa Solemnis as an Anglican, and he was able to practice the role of subdeacon at four Masses in quick succession, with the expert guidance of the LMS Chaplain, Fr Andrew Southwell. We asked him to give 'first blessings' (ie, of a newly ordained priest), after the Missa Cantata celebrated in Pantasaph, and again after the Solemn Mass we had in Holywell, when more people were present. The Summer School, and LMS Latin Course, has now concluded, and my photographs are uploading. We had a lot of fun, and did a lot of work, with just under 30 children at the Summer School and fifteen adults on the Latin Course, plus staff. I was delighted that our half-price offer on the Latin course attracted one priest, one current seminarian, and a young man about to start seminary. 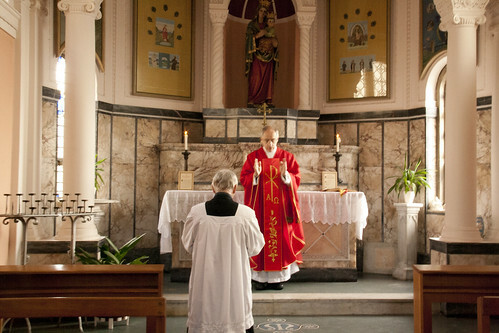 In helping with their Latin education the Latin Mass Society is making a very clear contribution to the good of the Church. This was our first use of the Franciscan Retreat Centre at Pantasaph. The Latin Course students and teachers were (mostly) accomodated at the St Winifride's Guest House in Holywell, which is next to the parish church and shrine, a five-minute drive from Pantasaph, where the Summer School students and (most of) the Summer School staff were. The Latin Course was taught at Pantasaph, and we all had Mass together. 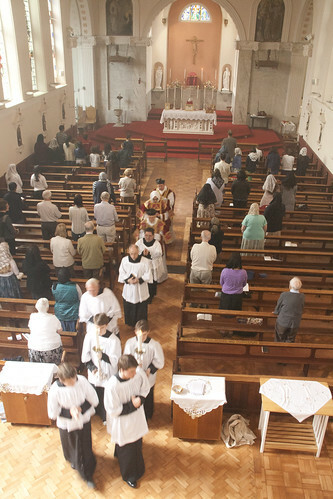 Fr Hunwicke's presence enabled us to have Solemn Mass five days in a row, from Tuesday to Saturday, with Fr Andrew Southwell, the St Catherine's Trust Chaplain, and Fr Thomas Crean OP, who also taught at the Summer School. 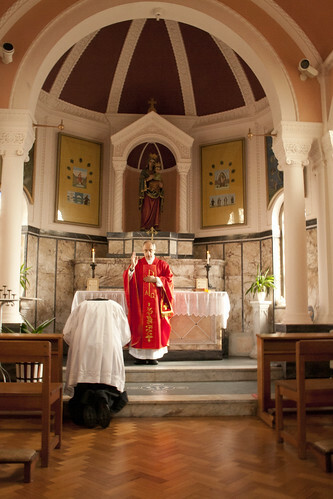 The photos above are of Fr Daniel Horgan, a priest of the Columban Fathers, who was a student at the Latin Course, celebrating Mass in the Lady Chapel at St Winifride's, Holywell. 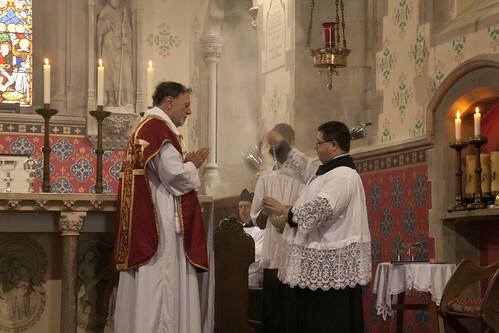 Immediately above, and below, is Fr John Hunwicke, of the Ordinariate of Our Lady, celebrating Mass (at the same time as Fr Horgan) in the chapel of St Winifride. 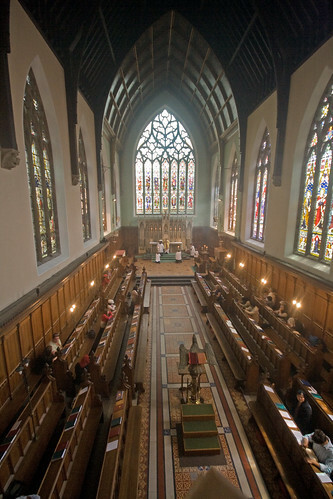 The statue above the altar is, of course, St Winifride, and the stained glass windowson either side show St James (Epistle side, with pilgrim's hat and shell), and St Philomena (Gospel side, with her anchor and arrow). On Wednesday, the Feast of St James, we had a Solemn Mass in Holywell parish church and visited the Shrine of St Winifride, and venerated the relic. So this post is dedicated to photographs of Masses in that church, thanks to the hospitality of Fr Salvatore Massala and the Visitation Fathers who look after it. 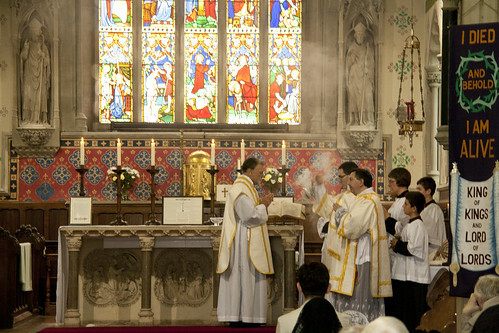 Here we are in the shrine, the building containing the spring, venerating the relic of St Winifride. In the FIUV Position Paper on Silence in the liturgy, Pope Benedict's book 'The Spirit of the Liturgy' was quoted, a magnificent passage on the profound prayerfulness of the silent Canon found in the Extraordinary Form. 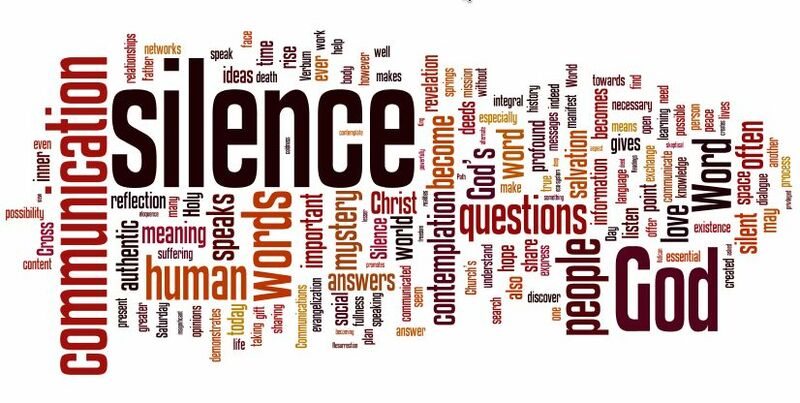 I've recently discovered another very interesting discussion of silence by Pope Benedict, in an exercise of the Papal Magisterium, a 'Message for World Communications Day' only this May, 'Silence and the Word'. He doesn't address the liturgy directly, but he has a lot of interesting things to say about silence in this short reflection. He starts with the obvious point that silence is a necessary part of communication, since only if you shut up yourself can you hear what the other person is saying. But he goes on to say that silence can be its own form of communication. It is often in silence, for example, that we observe the most authentic communication taking place between people who are in love: gestures, facial expressions and body language are signs by which they reveal themselves to each other. Joy, anxiety, and suffering can all be communicated in silence—indeed it provides them with a particularly powerful mode of expression. 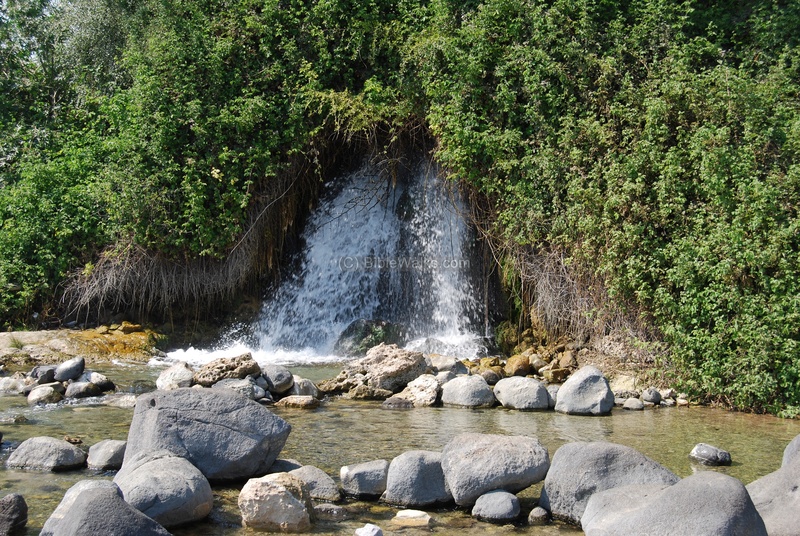 Silence, then, gives rise to even more active communication, requiring sensitivity and a capacity to listen that often makes manifest the true measure and nature of the relationships involved. When messages and information are plentiful, silence becomes essential if we are to distinguish what is important from what is insignificant or secondary. 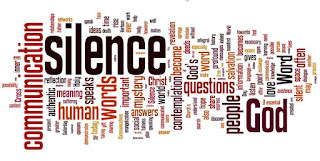 As the Cross of Christ demonstrates, God also speaks by his silence. The silence of God, the experience of the distance of the almighty Father, is a decisive stage in the earthly journey of the Son of God, the incarnate Word …. God’s silence prolongs his earlier words. In these moments of darkness, he speaks through the mystery of his silence. The silence of the Cross was often appealed to by the Fathers in their discussions of the silence of the Canon of the Mass. The effective communication to us of the important fact that God is Holy--is above us, is separated from us--by His silence, is a very interesting thought, which again recalls the Holy Father's published views on the importance of the liturgy communicating a 'sense of sacrality', as the Extraordinary Form does (as he said in the Letter accompanying Summorum Pontificum). I completely missed this at the time it happened; there's a not-particularly-interesting video news report about it here, maybe if they'd reported more about what the Pope said rather than what a couple of bloggers you've never heard of are thinking, it would have made more of an impact! 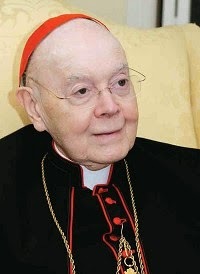 In 1989 the Congregation for Catholic Education, under the American Cardinal William Baum, published an Instruction, Inspectis dierum nostrorum, on the place of Patristics, the study of the Fathers of the Church, in seminaries. This document is available in the on-line version of the 'Acta Apostolicae Sedis' (82 (1990) 607-636) the official record of all curial documents, but only in Latin; it is available on the Congregation's page on the Vatican website, but only in Italian. Is this someoe's idea of a joke? That a series of documents lamenting the fact that fewer and fewer people can read Latin, are available only in Latin? For this is not a one-off. Pius XI's decree on Latin in Seminaries Officiorum omnium, the hugely important 1962 Veterum Sapientia of John XXIII, Paul VI's Sacrificium laudis of 1966: all call for more Latin, and by an amazing coincidence the Vatican translators haven't bothered to put any of them into English - or any other vernacular language, except, bizarrely, Spanish for Veterum Sapientia, and Italian for Inspectis dierum and Sacrificium laudis. And what's this? They haven't got round to an official translation of Summorum Pontificum yet either, except into Hungarian. Inspectis dierum is available on the website of the Bishops of the United States of America. This link appears to be broken from the main page but you can get the document here. It is a scan of a printed translation - better than nothing. Veterum Sapientia is available and thanks to the Latin Mass Society so is Sacrificium laudis. Not having English (or other vernacular) translations freely available is a pretty effective way of ensuring that no-one reads these documents, and asks any awkward questions about the education our seminarians are getting. I've heard that the translation of texts is not the task of the Congregation which produces them, but is overseen by the Secretariat of State, so this is an example of un-joined up thinking in the Curia. Here are some key passages. 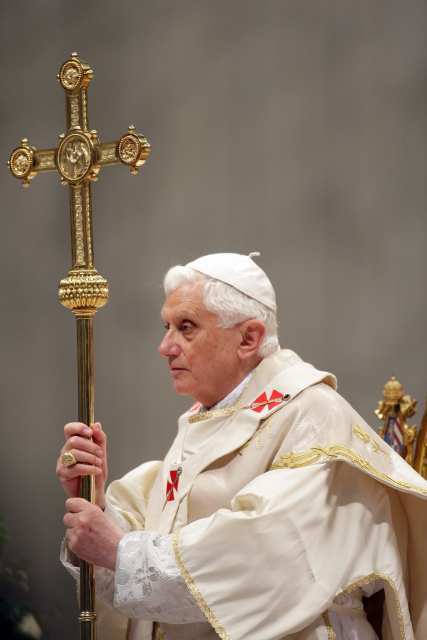 Popes and the Congregation for Education (and its former incarnations) have bemoaned the low level of clerical Latin, and called for improvements—culminating in Veterum Sapientia of February 1962 —since Leo XIII, himself echoing the alarm of the French bishop fifty-odd years earlier (in the 1830s!) when the French government-run schools dropped the Latin verse composition requirement. One of the watchwords of progressive theology of the Second Vatican Council era was 'ressourcement': 'going back to the sources'. This was a reaction to the over-use of textbooks in the bad old days. At least, in those days, the text books were usually in Latin, and as a result any seminarian could, with a bit of effort, read the original texts for himself if he wanted to, at least as far as Latin authors were concerned. Have we returned to the sources in seminary education? Alas no: most seminarians can't even understand the languages. Is reading a summary by a trendy modern theologian in the vernacular a good substitute? The Congregation for Catholic Education says NO! 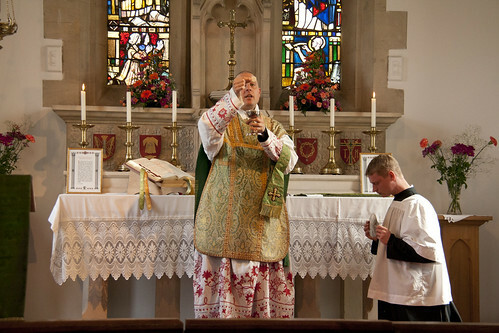 Fr Mathew Goddard FSSP will be celebrating Mass in St William of York, Reading, at 11am on Sunday 29th July. He is joining Fr Armand de Malleray FSSP in the Fraternity of St Peter's apostolate in Reading. 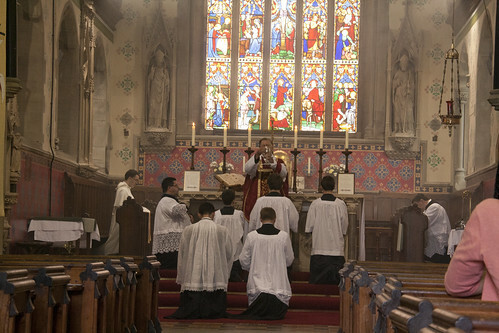 Fr Goddard is the first of the Fraternity's English recruits to be posted here, an important milestone for the order in England, and for the cause of the Traditional Mass here. 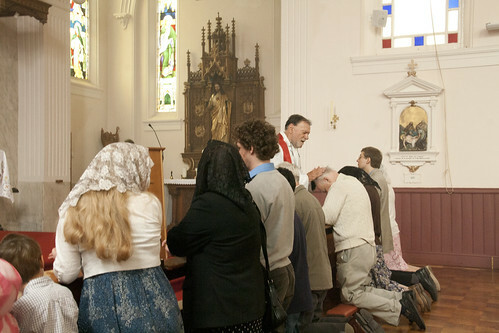 He celebrated Mass in Reading (above) shortly after his ordination, in the fraternity seminary at Denton, Nebraska, in 2009. Before that, as a seminarian, he was on the staff of the St Catherine's Trust Summer School in 2007. Since his ordination he's been gaining pastoral experience in one of the Fraternity's well-established apostolates in Canada. His father, a convert Anglican clergyman, is the custodian of the Shrine of Our Lady of Consolation in Sussex: here they are together (left and centre), on the occasion of the Summer School visit to the shrine, with Fr Andrew Southwell, the Summer School chaplain. So welcome to Fr Matthew, the first of many English and Welsh priests who will in time return to minster here, having been ordained for the traditional orders. I won't be at this Mass, annoyingly, since it will be the last day of the Summer School, which is starting tomorrow. Next week will therefore be a bit of blogging hiatus; I'll be back with the start of August. 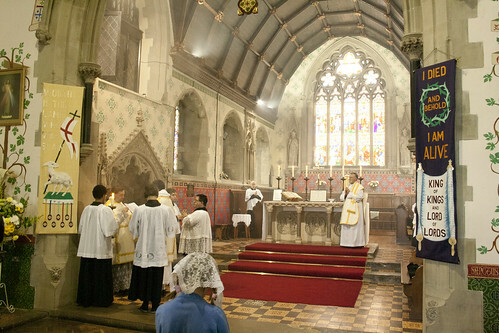 The other day I went to a meeting of the Latin Mass Society Representatives in Clifton diocese, with a number of the priests who say the Traditional Mass there. 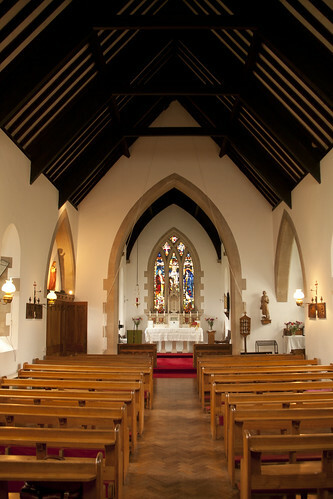 Before the meeting Fr Alexander Redman, our regional Chaplain for the South West, said Low Mass in one of his two churches for us: St Joseph's, Nymphsfield. 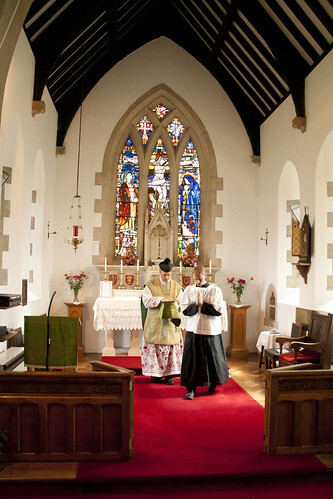 It is a very unusual Catholic church: it looks exactly like an Anglican country church. 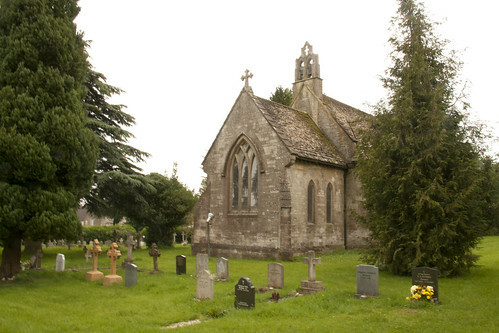 I don't mean that in a derogatory sense, but set in its own plot, with a graveyard round it, in the Gothic style, bells on the top: you just don't see Catholic churches like that in villages. It seems a wealthy Catholic family, the Leighs, bought the village up when the Anglican church was in ruins, and created a Catholic village, complete with a convent (the Marist Sisters) running an extensive orphanage, using many of the village cottages as model homes for the children. An astonishing achievement. 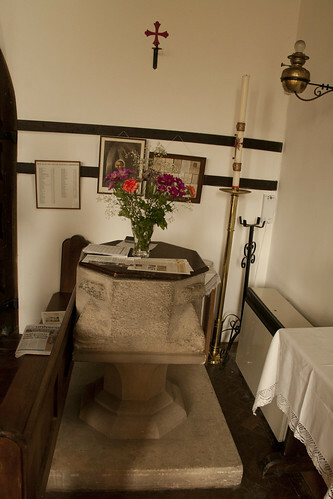 They even found the medieval font, which was in field somewhere, and put it into their church. 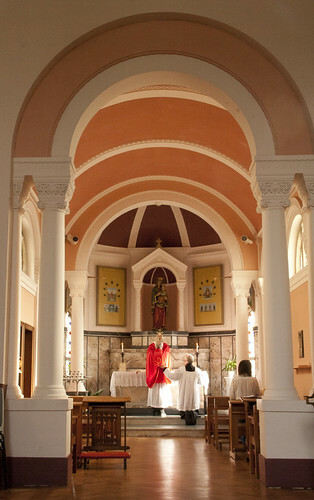 It is very good to see the ancient Mass restored to this church. 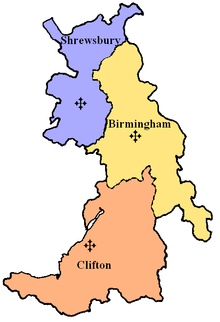 The diocese of Clifton has the largest number of Sunday EF Masses of any diocese in England and Wales. This is all due to the energy and enthusiasm of a wonderful group of priests, who are now so numerous in the diocese that others are emboldened to try the Traditioinal Mass for themselves. During the meeting it was quite amazing to hear how many priests are able to say the Mass; sometimes the problem is simply one of scheduling them, or being in the right part of the diocese to fill a gap in provision. This is a real fruit of the Latin Mass Society Priest Training Conferences, which have been heavily used by Clifton priests. That is partly why we've had a couple in the South West, at Downside and Belmont. Let's hope they get a sympathic 'Chief Executive' to reign over them! 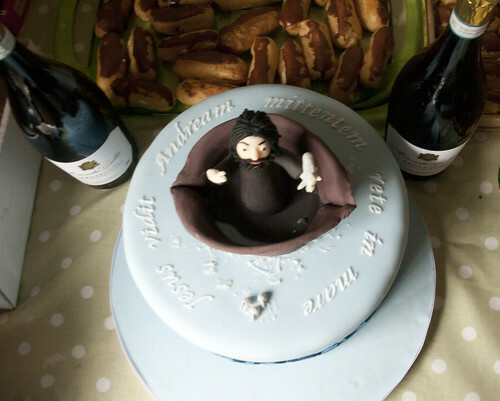 Our National Chaplain, Fr Andrew Southwell of St Bede's, Clapham Park, turned 50 last month, and at about the same time he announced that he's taking a sabbatical: two years in Rome studying at the Angelicum. 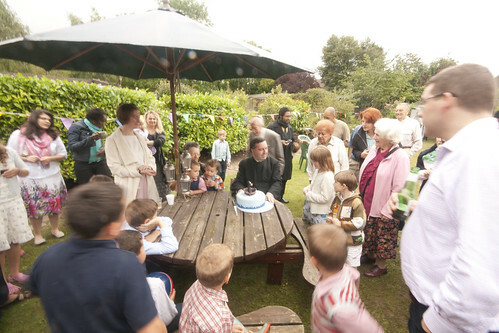 His South London flock organised a big party for him, which would have been incomplete without a cake. And a bit of rain. 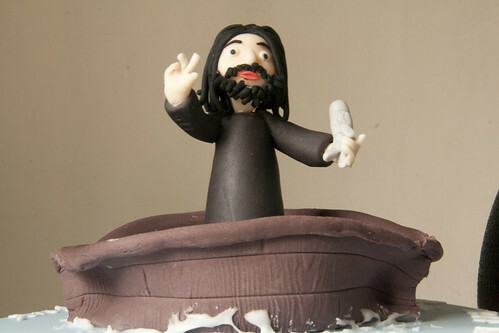 The cake shows the Call of St Andrew. Courtesy of Lucy Shaw Cakes! 3. 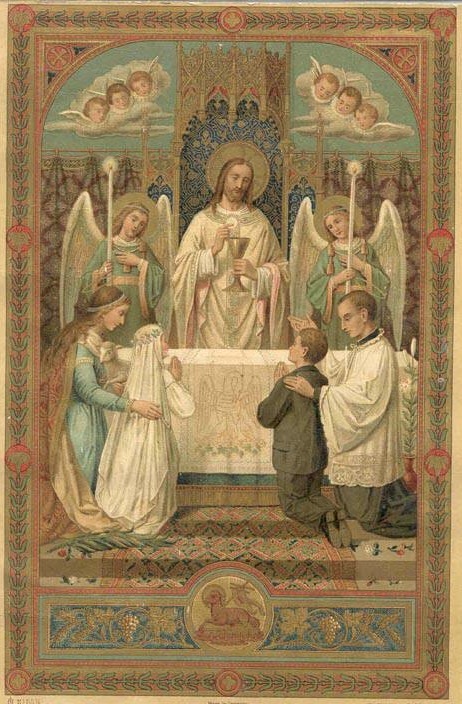 Although it is especially fitting that those who receive Communion frequently or daily should be free from venial sins, at least from such as are fully deliberate, and from any affection thereto, nevertheless, it is sufficient that they be free from mortal sin, with the purpose of never sinning in the future; and if they have this sincere purpose, it is impossible by that daily communicants should gradually free themselves even from venial sins, and from all affection thereto. Yes, you read that correctly. The EWTN translation really, truly, leaves the 'NOT' out of the last sentence, rendering it unintelligible. On this occasion EWTN seems to be the only organisation on the web to have an English translation. I suspect, sadly, that this is not a simple typo (although there does seem to be a proof-reading problem here), since the Latin's way of expressing the 'not' is slightly unusual. 'Fieri non potest' means 'It is impossible that it happen', and 'quotidie communicantes a peccatis ... venialibus ... se expediant' means 'daily communicants should free themselves from venial sins'. What's this 'quin' between one and the other? My Oxford Latin Dictionary gives, among other meanings, 'it would be surprising if ... not'. 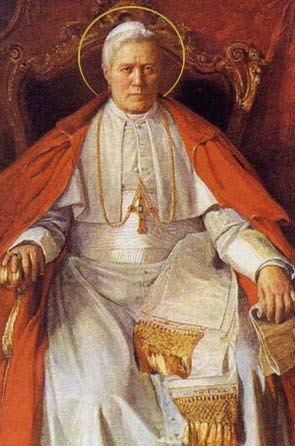 What St Pius X is saying is that it is absurd to imagine that sincere daily communicants should NOT gradually free themselves from venial sin. Communion is the bread of wayfarers. It sustains the Christian life. 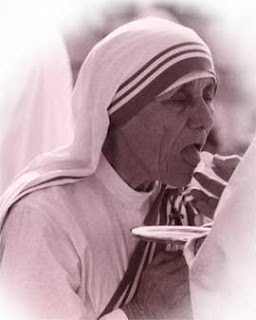 Let us not fail to take advantage of this great Sacrament of Love, and not allow scruples, if such they be, to stop us. We don't wait to be free of all venial sin before approaching Communion: Communion will help free us from venial sin. The poison of Jansenism, however, which, under the pretext of showing due honor and reverence to the Eucharist, had infected the minds even of good men, was by no means a thing of the past. Thanks to him, it now is. Thanks to various things which have happened since his day, we have now gone to other extreme. But that must be the topic for another day. Fancy being 'Chief Executive' of Clifton Diocese? Here's the main blurb. Why not apply? The Catholic Diocese of Clifton is seeking to appoint a Diocesan Secretary to fulfil the role of Chief Executive and coordinate the administration of the Diocese. Will create an approach to balancing the quality of service to clergy and parishes with the management of risk. Closing date: 5.00 pm Monday 13 August 2012.
insights into the workings of the diocese. 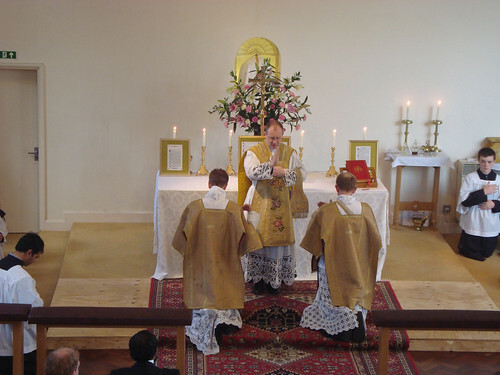 The General Chapter of the Priestly Fraternity of St. Peter (FSSP), gathered from July 3 to July 18, 2012 at the International Seminary of Our Lady of Guadalupe, Denton, Nebraska, in plenary sessionelected Fr. John Berg as Superior General for 6 years. This election, at which the 33 capitulants were present, took place on July 9. The Pontifical Commission Ecclesia Dei was immediately informed and sent a congratulatory message. In my last post I promised to give arguments in favour of Communion on the tongue that actually work. …out of reverence towards this Sacrament, nothing touches it, but what is consecrated; hence the corporal and the chalice are consecrated, and likewise the priest’s hands, for touching this Sacrament. Hence, it is not lawful for anyone else to touch it except from necessity, for instance, if it were to fall upon the ground, or else in some other case of urgency. There is something going very wrong when a developed position like this is rejected in favour of a undeveloped position like that of St Cyril of Jerusalem. 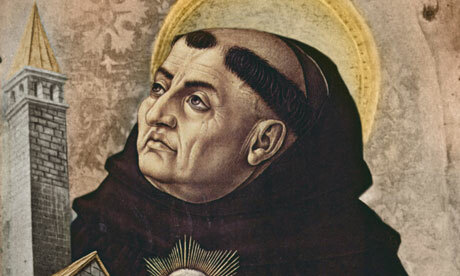 It is perfectly evident the Aquinas' position is a natural resolution of the tensions inherent is the situation described by St Cyril: Communion in the Hand combined with a tremendous concern for the fragments which might be lost, and elaborate rubrics designed to prevent that. The liturgy of the early ages is most certainly worthy of all veneration. But ancient usage must not be esteemed more suitable and proper, either in its own right or in its significance for later times and new situations, on the simple ground that it carries the savour and aroma of antiquity. 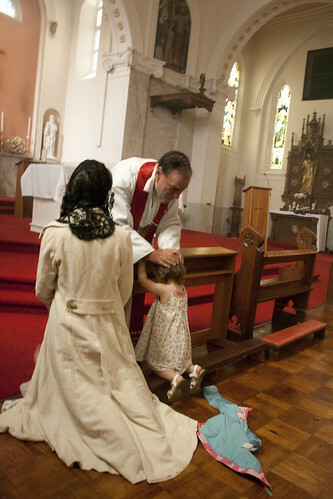 The more recent liturgical rites likewise deserve reverence and respect. They, too, owe their inspiration to the Holy Spirit, who assists the Church in every age even to the consummation of the world. [Matthew 28.20] They are equally the resources used by the majestic Spouse of Jesus Christ to promote and procure the sanctity of man. So here are my three knock-down arguments in favour of Communion on the Tongue. 1. The Communion in the Hand practiced in the early Church is not like Communion in the Hand today: it was much more ritualistic and reverent. So much so, in fact, that most people would regard it as impractical. Jungmann, for example, talks about special fountains being installed in front of St Peter's so that people could wash their hands before Communion. In some places a cloth was placed over the hands (of women, at least), like a houseling cloth. St Cyril makes it clear that you don't pick the Host up: you put it in your mouth directly from your palm (having raised it to your eyes first). 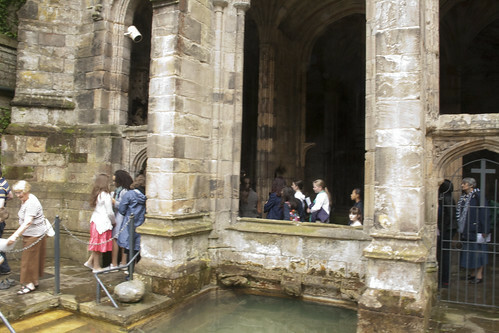 In some places there was a ritual washing of the hands after Communion. Reception on the tongue begins to look like a sensible alternative, doesn't it? 2. Communion on the Tongue spread throughout the Church, from the 9th Century onwards, in the context of a concern for the fragments which might be lost. 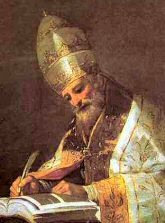 The concern with fragments is not some late-medieval scruple, it is anticipated in Scripture (John 6.12) and found throughout the Fathers, including St Cyril of Jerusalem: hence his concern about reception being done with enormous care. This concern finally found a practical and reverent outlet in the different practices adopted in East and West. In the West, with unleavened bread being used, Communion directly on the tongue makes particular sense. This is the judgement of the Church, in her wisdom, having considered and experimented for many centuries; this judgement is then universally accepted and practiced for a millennium. What more straightforward example of the guidance of the Holy Spirit could you ask for? 3. 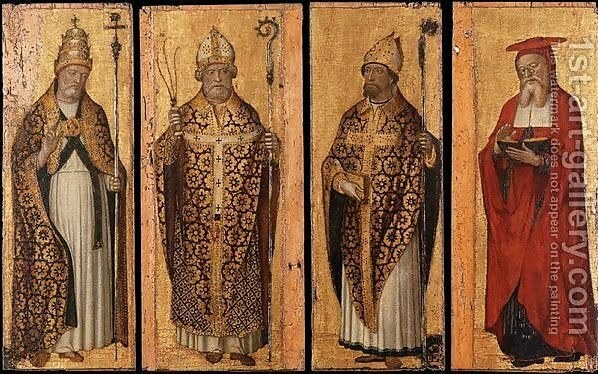 The judgement of the Church in the Middle Ages is reiterated in the law of the Church as currently in force. Pope Paul VI in Memoriale Domini (1969), said that the practice should NOT be changed, because of the issue of reverence towards the Sacred Species. Redemptionis Sacramentum (2004) 92, tells us that, even when it has been permitted by a special indult, Communion should NOT be given on the hand if there is a 'risk of profanation'. And that, of course, is all the time, everywhere, outside an enclosed religious community. For a fuller treatment, see the FIUV Position Paper. Everyone knows that the internet is not a good scholarly source, but the misinformation out there can be shocking. I've spent plenty of time criticising liberals, so here's a warning: traddy website can lead you astray too. The internet encourages uncritical reproduction of claims presented as facts, and if enough people do it they start generating so many Google hits that the truth can be drowned out. That's where websites with some claim to authority come in handy. Wikipedia? Not exactly. Take the debate about Communion on the Tongue vs. in the Hand. There are lots of website and blogs slogging it out, with more zeal than knowledge. I'm no Patristics scholar, but it seems worthwhile to point out that a number of commonly cited authorities on the subject simply don't prove anything either way. Here are two classic quotations used in favour of Communion on the Tongue. But this is not inconsistent with Communion in the hand. Leo mentions the mouth because it is with the mouth that heresy is spoken. It is perfectly possible that he's talking about taking Communion in the mouth having been handed it in the hand. This appears to be a stronger indication at first glance. This is certainly a case of Communion given on the tongue. But it is not necessarily inconsistent with a general practice of Communion in the hand: the man was clearly severely handicapped, and the point of mentioning the mouth is that the man was cured of his inability to speak. In other words the holy man applied the medicine of salvation directly to the affected part. These quotations simply don't answer the questions: was communion given in the hand or on the tongue in the time of these Popes? That simply cannot be established with certainty. Another thing I've discovered is attempts to show that the classical description of Communion in the Hand by St Cyril of Jerusalem (d. 386) is some kind of forgery. Now the five follow-up lectures are highly debated and may not be authentic. In other words, they may have may been added by someone other than Saint Cyril. In fact, there exist manuscripts that do not attribute these five lectures to Saint Cyril. Hence, it is not entirely responsible to quote these last five lectures as a valid authority. The five later lectures are questionable. But this again simply misses the point. The description could hardly have been inserted into St Cyril's writings if it was not accurate, as a record of what happened. 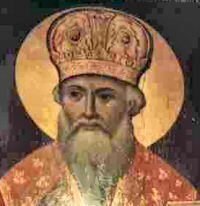 Regardless of who wrote it, if it was happening in St Cyril's day, then St Cyril was presumably happy about it. And anyway, the debate doesn't necessarily turn on what St Cyril thought about it, but about what was the practice of the ancient Church. This was the practice of the Church of Jerusalem in the 4th Century: that's an interesting historical fact. Then there is the Council of Rouen, which forbids Communion in the Hand and mandates Communion on the Tongue. Nice and clear, and this is indeed the earliest source for a clear ruling against Communion in the Hand. Now when was that? A quick internet search gives the date 'c.650' on a large number of site, including Wikipedia. But the great liturgical scholar Joseph Jungmann says it took place c. 878, 228 years later. I know who I believe. Those who want to defend Communion on the Tongue, as I do, need to exercise self-discipline: using bad arguments and dodgy quotations is ultimately self-defeating. There are three arguments in favour of Communion on the Tongue which I regard as decisive. I'll give them in my next post. The retreat begins at 11.00am and will be preached by Mgr. Gordon Read. 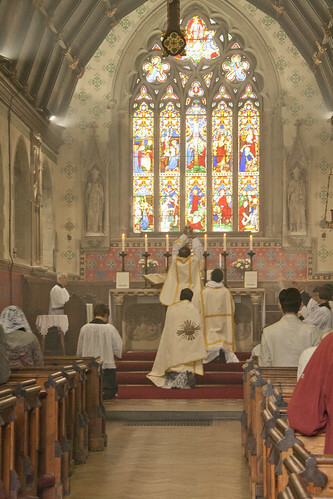 Solemn High Mass (Extraordinary Form) will be celebrated at 12 noon. 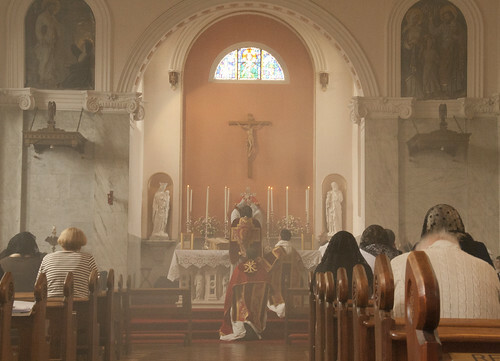 Solemn Vespers and Benediction at 3.30 p.m. The cost of the Retreat will be £6. For more information contact: Mike Mason on telephone no. 01983 567996 or Mobile: 07810 778160. Click to a MAP HERE. Recently we went to Venice to celebrate 25 years of marriage, and had a wonderful time visiting this extraordinary city with its remarkable hospitality. 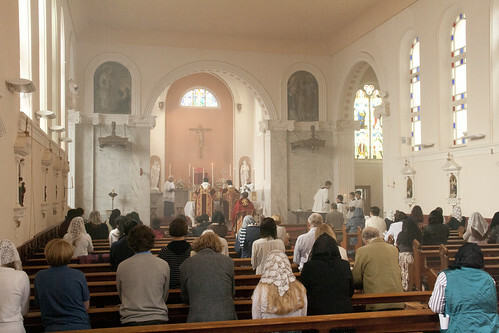 We attended Mass, and visited seven churches which as it happens were all offering Mass at some time in the day. It was lovely to hear the bells calling us to this prayer. 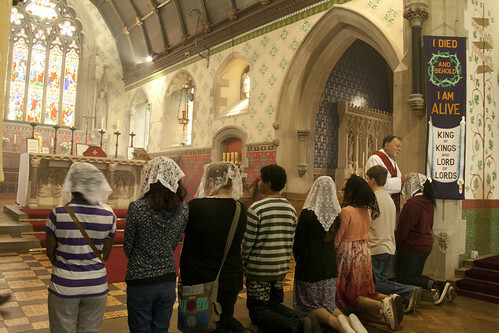 But we were shocked at the Church’s inattentiveness to visitors. Venice welcomed 16 million tourists last year. The principal languages of the international visitors are German, English and French. We saw no evidence of any attempt in any church to explain anything about the Christian faith in any language except Italian. In fact, we saw only one church with information about the Christian faith. We saw no evidence of Mass being offered in any language except Italian. 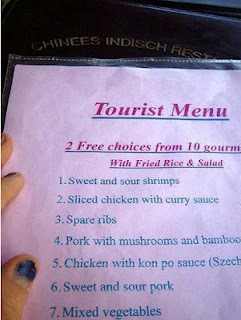 Hospitality? Well, at least some of the church guardians were polite as they took the entry fee. The idea of the liturgical equivalent of the 'tourist menu', at the sight of which every self-respecting visitor flees from a restaurant, is alarming. The Tablet published my reply. As usual I highlight what they edited out. Mr & Mrs Barton (Letters, 30 June) were disappointed to find Masses in Venice only in Italian. But it hardly seems attractive for Italian resorts to provide 'tourist Masses' in English and German. Do we really want to travel the world in a bubble with our fellow Anglophones? What the Universal Church needs is a universal language. Funnily enough, it has one: Latin, a language 'friendly to all', as Pope John XXIII put it. 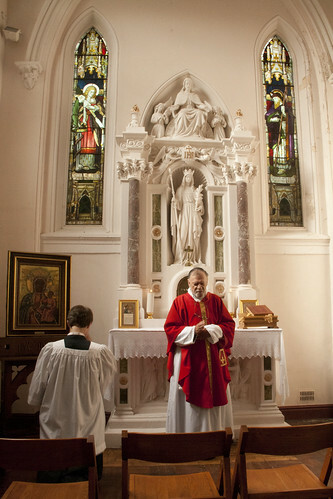 On future visits, the Bartons will find the traditional Latin Mass being celebrated in Venice by an English-born, polyglot priest of the Fraternity of St Peter, Fr Konrad Loewenstein, at the Church of San Simon Piccolo. Googling 'FSSP Venice' will give them all the details. I wonder why they removed the word 'polyglot'? Is it too long for Tablet readers? Fr Loewenstein, being born in England of a German family, and living in Italy, speaks several languages. The Fraternity of St Peter is a truly international order. 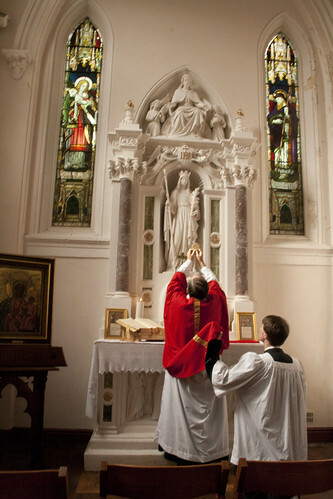 Fr Loewenstein's father, Prince Rupert Loewenstein, is of course one of the Latin Mass Society's Patrons, a very long-standing supporter of the Society. May Fr Konrad's apostolate continue to flourish! 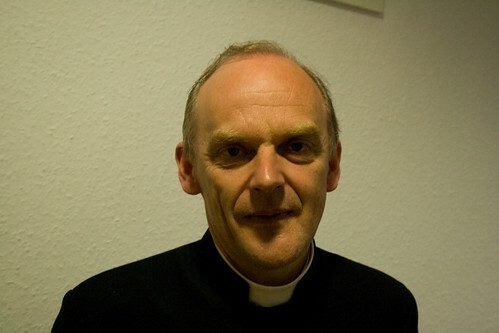 This isn't a brilliant photo of Fr Loewenstein, but I took it myself when I saw him at the FSSP Seminary at Wigratsbad, Bavaria, on the occasion of the ordination of another multi-lingual Englishman, Fr William Barker, in 2009. Fr Barker, too, is working in Italy, in Rome. The FSSP Venice website is rather magnificent, it is one of those which bursts into song as soon as you download it. Pay them a visit!